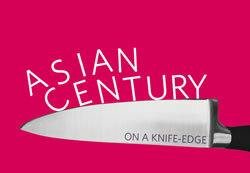 What is the Asian Century Institute? The Asian Century Institute (ACI) conducts research and analysis, and participates in policy dialogues to foster a better understanding of the opportunities and challenges of the Asian Century. A successful renaissance of Asia in the 21st century ("an Asian Century") offers the prospect of peace, prosperity, security and stability the world over. But a close reading of Asia's situation suggests that the future is full of great economic, social and political risks and possible fractures, as well as opportunities. We must all work together to understand and manage the opportunities and challenges of an Asian Century. The ACI hopes that it might make a modest contribution to the successful realization of an Asian Century, following America's 20th century and Britain's 19th century. The ACI was launched in September 2012 by Executive Director John West and Technical Director Jean-Charles Edel. John has had a long career as an international economist, with major stints at the Australian Treasury, Organisation for Economic Cooperation and Development, and the Asian Development Bank Institute. Jean-Charles is also Executive Director of "e-creatif", an enterprise that provides webmaster, webdesigner and webmarketing services. We have two new recruits who have just joined the ACI. Emanuele Schibotto from Italy will be Director for Development. Emanuele is also a PhD candidate in Geopolitics at the Guglielmo Marconi University in Rome and Director of "Equilibri.net", an Italian think tank on Geopolitics and International Relations. Biswa Bhattacharyay from India will be Strategic Advisor. Biswa joins following a distinguished career at the Asian Development Bank, ADB Institute and elsewhere. He is now also affiliated with: University of International Business and Economics, Beijing, China; FORE School of Management, New Delhi, India; and Yunnan University, Kunming, China. John West has personally financed the initial launching of the ACI. Attractive opportunities exist for philanthropists, corporate social responsibility programs, and other donors to contribute to the continued financing and the possible expansion of the ACI. Where is the ACI located? The ACI's principal bases are Toronto, Paris, Sydney,Tokyo and Milan. We have recently established our new headquarters at Toronto's Center for Social Innovation. The ACI is a network-based institute which cooperates with a wide range of knowledge partners, namely, Frost and Sullivan, Global Economic Intersection, Third World Centre for Water Management, Official Monetary and Financial Institutions Forum, The East Gallery, Growing Capacity, The Airport Economist, Equilibri, The Global Foundation, Media India Group and Yishu. Attractive opportunities exist for new knowledge partners to join forces with the ACI. What are the ACI's recent activities? The ACI has participated in a wide range of policy dialogue activities over the past year, including: OECD Week 2013; 4th UNI Apro Joint Sector Conference; Joint OECD/ University of Western Sydney workshop on new sources of growth; Friedrich-Ebert-Stiftung Tokyo conference on renewable energy; Pacific Economic Cooperation Council's 21st General Meeting; Beijing Forum 2013; National Conference of National Employment Services Association of Australia; Wollongong University workshop on Asian Century; and OECD symposium on Shrinking and Ageing Labour Markets in Japan. We prepared a report entitled "Towards fair, inclusive and stable finance in Asia" for UNI Apro. We delivered a course entitled "Development Issues: Asia and the World" at the Summer Session in Asian Studies at Tokyo's Sophia University. Articles from the ACI website have been published widely such as by the OECD Observer, Korean Herald, Global Economic Intersection, East Asia Forum, Asia Sentinel, Equilibri, APEC Currents, Growing Capacity and Pacific Economic Cooperation Council. The ACI website provides a growing forum for outside contributors. The ACI provides modest financial support to the following organizations: Asia Pacific Foundation of Canada, Human Rights Watch, National Bureau of Research's Japan Forum, and The Asia-Pacific Journal: Japan Focus.